During and after every cavalry engagement, horses could be seen wandering back from the melee carrying their wounded riders to safety behind the lines. 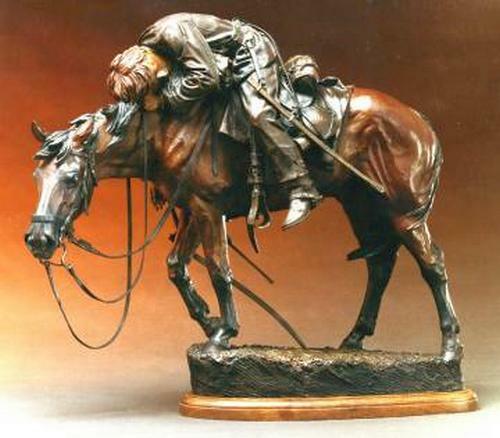 This piece represents the double bond that frequently existed between a cavalryman and his horse. This was most especially true of both the Southern riders, who had grown up with an affinity for fine horses, and the troopers on the Western frontier where to be horseless was certain death. Every cavalryman, however, quickly learned that his welfare rested on the four feet and noble heart of his horse. The wounded rider being "Carried to Safety" is wearing general issue "sack coat" or fatigue blouse common to both the Union and Confederate soldiers, as well as the few remaining troopers stationed "out West" during the 1860s. He wears U.S. mounted trousers (reinforced seat) and Federal issue boots. He is armed with a .52 cal. Model 1859 Sharps carbine, .44 cal. Colt's Army pistol, and Model 1860 light cavalry sabre. His horse is equipped with Federal issue Model 1859 equipments (U.S. rosettes missing from the bit) with grain nosebag, haversack, canteen, overcoat and bed blanket. The 19 year old who modeled for this piece and several other works was like a kid brother to me, an older brother to my son, and "Special Friend" to my daughter. His antics on our pack trips still spark a smile. In re-enactments, he and I had gone into many cavalry charges together. The faithful horse and trusty gun of this courageous youth were always at my side. He "lived" a hundred twenty-five years ago, as surely as he will always live in the hearts and minds of those of us who loved him. He was killed in an automobile accident the night I finished this piece. It is dedicated to Thomas Layne Hall and all the brave troopers who have been ‘Carried to Safety.'"